Spinal stenosis from spondylolisthesis can occur due to misalignments in the central vertebral canal. Listhesis can be a major contributor to central central and foraminal stenosis, although it is seldom the exclusive cause, except in the very worst vertebral slippage profiles. Spinal stenosis is a completely normal narrowing of the central vertebral canal and is usually created by the passage of time and the occurrence of normal life activities. Most stenosis will never progress to symptomatic levels, despite structurally worsening as long as life endures. Some stenosis can become mildly symptomatic, while other cases can become absolutely debilitating. Demonstrating significant listhesis certainly disposes any particular patient towards the development of atypically severe versions of stenosis, especially with advancing age, but this is not to say that stenosis caused by vertebral migration will always become symptom-generating. This valuable and insightful dialog focuses on shedding light on one of the major consequences of vertebral listhesis: the development of central spinal stenosis. We will explore why stenosis is influenced by spondylolisthesis and also explore why some stenotic formations become pathological when most are simply innocuous signs of aging. The central spinal canal runs vertically through each vertebral bone, aligning with the bones above and below in a normal spinal anatomy. This creates a perfect passage for the spinal cord, spinal nerves and other tissues to span the vertebral column from the brain down to the coccyx. 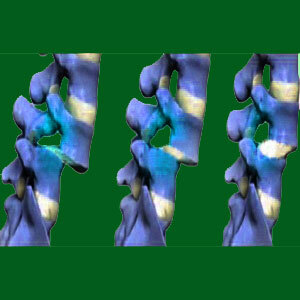 All varieties of listhesis change the alignment of the spinal canal to lesser or greater degrees. The worse the clinical significance of the listhesis appears, the greater the misalignment of the central vertebral canal will typically become. Stenosis is normal to experience in people who are not affected by listhesis. Disc desiccation incites the arthritic processes. Arthritis affects the spinal joints and vertebral bones, breaking down their protective measures and creating debris accumulations and osteophytes within the central canal. Additional contributory factors can include atypical spinal curvatures in the coronal or sagittal planes, such as scoliosis, lordosis or kyphosis, as well as herniated discs and ligamentous abnormalities like hypertrophy or ossification. Most stenosis will never actually compromise the integrity of the spinal cord or cauda equina. However, in some cases, the degree of stenosis can become problematic and listhesis can certainly be a major contributor to these symptomatic examples of canal narrowing. If the spinal canal is misaligned by a significant amount, then the usual stenotic processes can compress nerve tissues even when their degree would not normally be considered symptomatic. When the spinal canal becomes narrow enough to negatively influence nerve tissues, spinal cord or cauda equina compression can take place. Nerve tissues require adequate space to function correctly and if they are compressed, they will not be able to signal normally, if at all. The potential results of nerve and/or cord compression include local pain, pain in innervated areas of the anatomy, tingling, numbness and weakness in innervated areas of the anatomy, as well as functional and autonomic deficits. In traditional listhesis locations in the lower lumbar spine, the results of central stenosis will affect the cauda equina tissues, often en masse. There may or may not be lower back pain, but sciatica is likely and will involve pain, numbness, burning and weakness in the legs. Saddle paresthesia might also be present, along with the possibility for sexual dysfunction, incontinence of bladder and/or bowels and the inability to stand up. In cervical listhesis conditions, the spinal cord can become compressed. Results can range greatly, since the effects can influence any bodily location or system from the neck down. Symptoms might mirror those of lumbar listhesis-enacted symptomatic stenosis, but might also include the following expressions: pain, tingling or numbness in the neck, shoulders or arms, as well as autonomic or systemic dysfunction in any of the internal organs or systems of the torso and abdomen. Stenosis can be treated using various surgical techniques, depending on the causative circumstances of onset. For spondylolisthesis patients, spinal fusion will usually be the primary surgical objective to restore the migrated vertebral bone to its typical anatomical placement in relation to the remainder of the vertebrae. However, simply using fusion to correct the listhesis will not address the stenosis that might have accumulated in areas of focal misalignment within the spinal canal. Therefore, other procedures will most often be added to clear away sections of reduced patency. These procedures will likely include laminectomy and discectomy, but may also include foraminotomy and corpectomy in less common circumstances. Stenosis is not generally considered treatable using conservative methods of care, since it involves the build-up of material inside the spinal canal. In rare instances, focal disc-related stenosis can be resolved using nonsurgical spinal decompression, but this is not a viable option for patients who also demonstrate spondylolisthesis. Spinal stenosis is a complicated health issue that is covered in its entirety in our web resource Spinal-Stenosis-Treatment.Org.